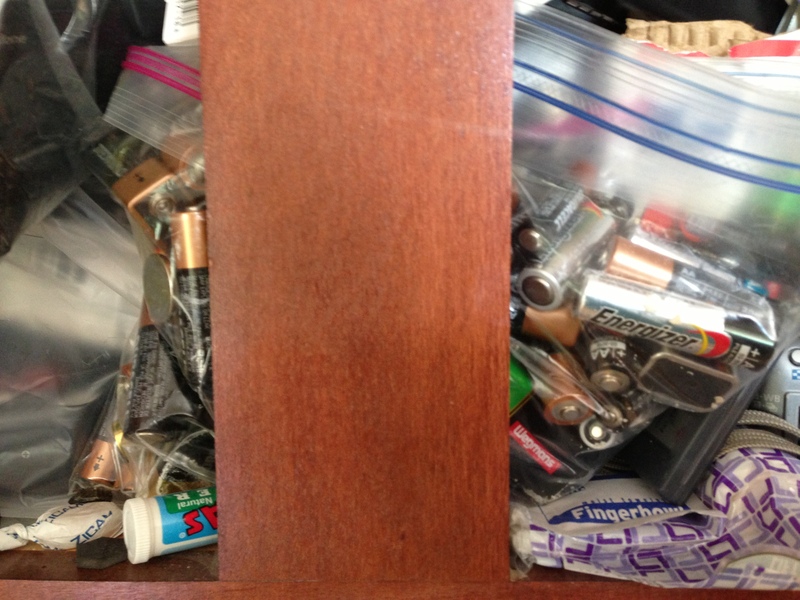 Clump #37: Recycle bag of spent batteries. Imagine opening this cabinet and disturbing the bag of used batteries, spilling them out and sending them skiddering onto the counter below. Arggh! So annoying! It’s those little things in life that really get to you. My husband had taken a bunch out of the cabinet as a short-term strategy while saying we had to get rid of them. Agreed. I was going to surprise him at the beginning of the week by getting the whole lot recycled. Oh, how surprised and happy he will be, I gleefully thought. I spent the morning looking up information and calling various stores. Our township office advised me to just throw them away in our regular trash; they are not accepted at hazardous waste drop-off days. I couldn’t picture throwing them out all at once. Then a ray of hope: a saleswoman at Home Depot said they would take them. Hooray! 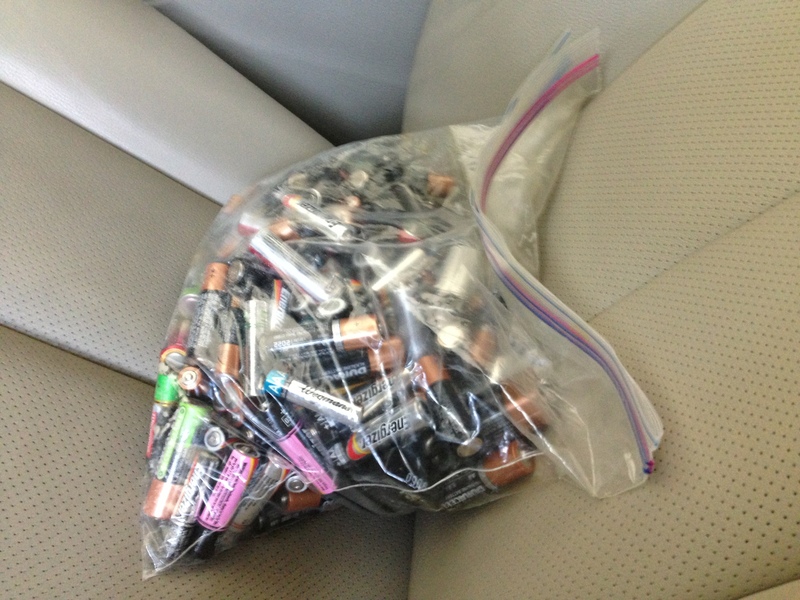 I strode into Home Depot, plopped down the bag, and was promptly informed by a saleswoman (maybe the same one) that they only take rechargeable batteries. Curses! To be fair, Best Buy, Target, and Lowes do not accept them either. 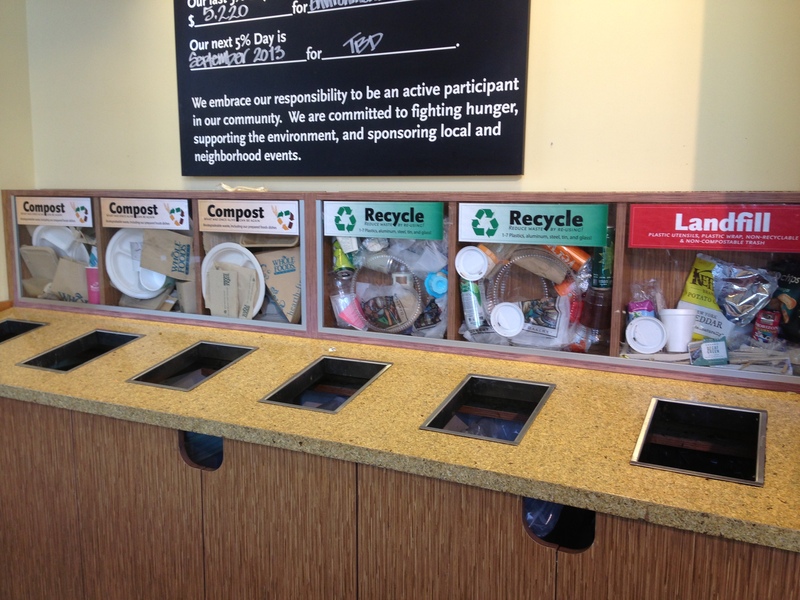 I had called a Whole Foods Supermarket, and was told very nicely that they used to collect them, but not anymore. Defeated. On to another clump. 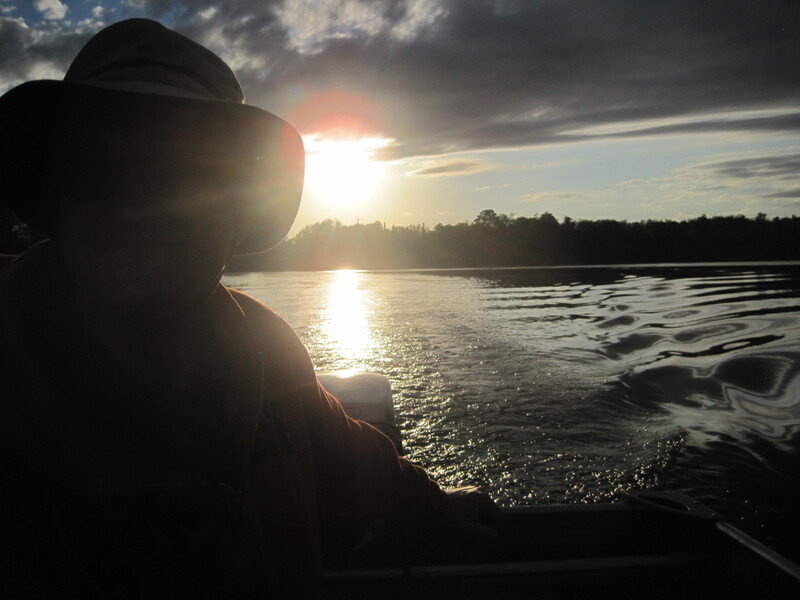 Later that day, my husband (silhouetted here in a Minnesota sunset) came home from work and casually mentioned that he had been to the Plymouth Meeting Whole Foods store (a different one than I had called), and had almost bumped into some collection buckets for alkaline batteries. “Say What?! ?” The universe truly works in mysterious ways. So I finally had my moment of closure today. This isn’t much of an action shot, and you can’t even hear the angels singing. 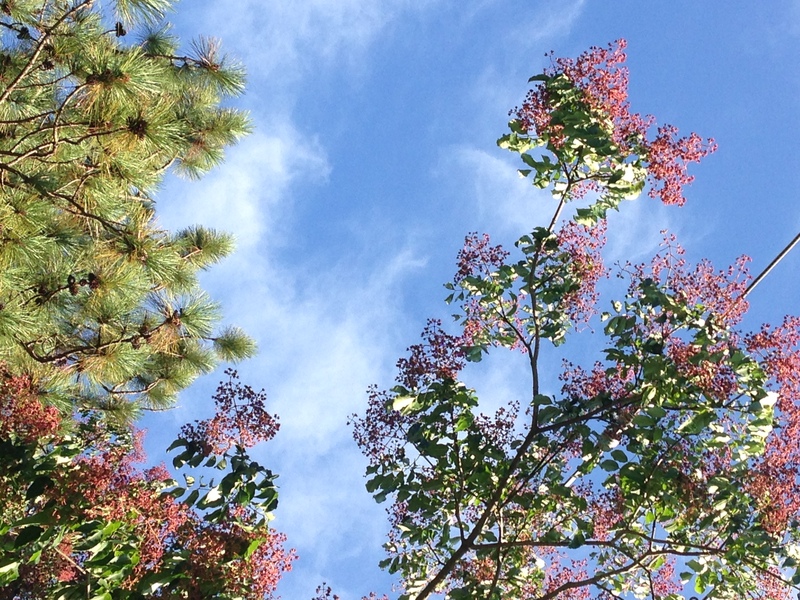 It was such a beautiful day today, in a world worth taking that extra step to protect. Okay so far, so good. I wasn’t planning on burning them. Well, clearly, I could have disposed of them “in large numbers” had I followed the instructions of our township office. I don’t know about you, but that does not make me feel reassured. If your family is anything like ours, we go through a frightening number of these babies, powering all the electronic devices we can’t seem to function without. 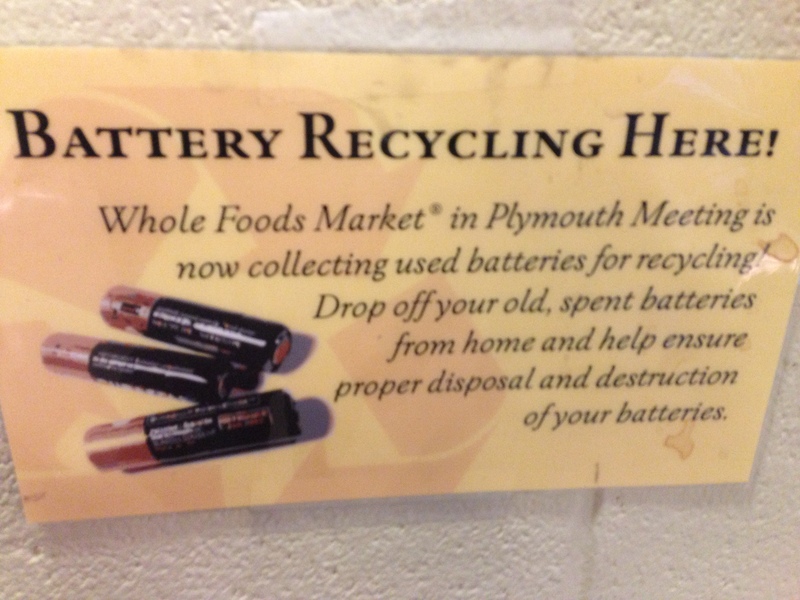 I will continue to bring my batteries — and my business — to the Plymouth Meeting Whole Foods store. 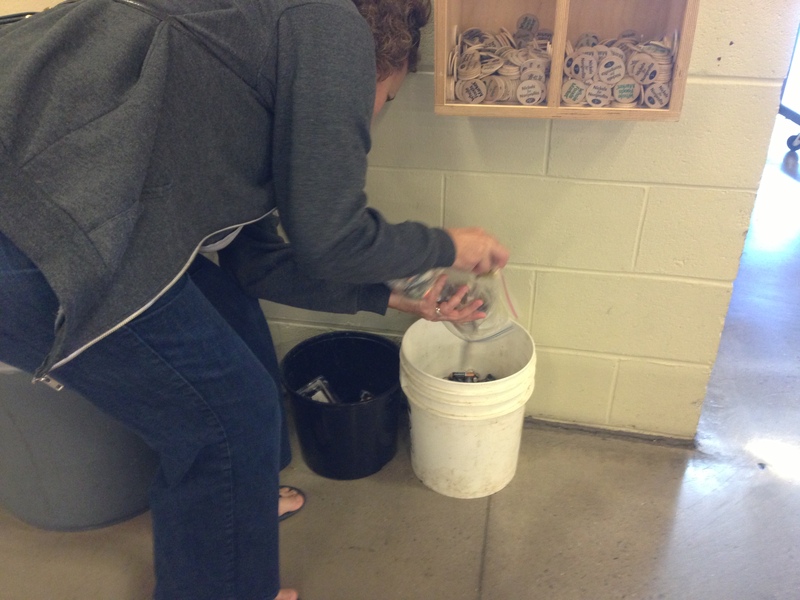 Here is their trash area: Compost, Recycle, or Landfill. Your choice.